UPDATE: (Sept 2016) The result of the ballot was to only narrowly in favour of strike action. The HE Executive therefore took the decision not to proceed with Industrial Action in this instance. 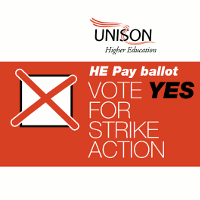 UNISON is balloting members in higher education, urging them to vote ‘Yes’ for strike action for better pay. The decision of the higher education service group executive was taken following a consultation with branches. The employers have so far refused to increase their 1.1% offer for the majority of staff that also does not deliver the Living Wage for the lowest paid. Make sure you VOTE in the ballot - papers are being sent direct to members homes. The average pay rise for Vice Chancellors in 2014/15 was a whopping 6.1% rising to an average of £274,405! UNISON has called the offer ‘deeply hypocritical’ - as staff are offered a miserly 1.1% to cover their rising household bills - while at the same Vice Chancellors have called for a 2.8% increase in tuition fees in England to cover University ‘costs’. Despite low inflation, essential costs such as water bills, public transport and car parking have all gone up this year. UNISON believes that an increase is affordable - money is available for a higher pay increase this year universities holding cash surpluses of nearly £21billion! And the need for our members is urgent. The Higher Education Funding Council for Wales reported a total surplus of £60m, while the English funding body (HEFCE) reported in March 2016 a surplus of nearly £1.8bn! Scotland Universities posted a surplus of £166m and Northern Ireland had a surplus of £27m. UNISON believes that universities can afford to improve on their miserly offer. For more information see the Higher Education Pay 2016 website.